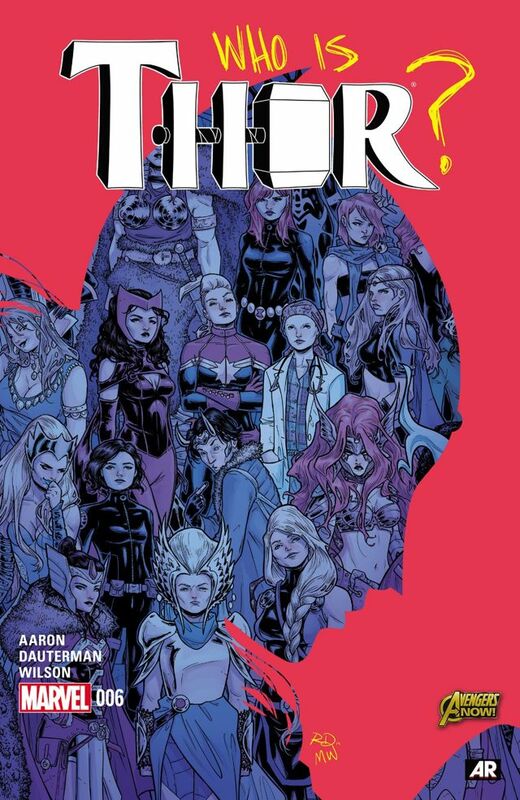 Comic Review: Thor #6 – Who Holds the Hammer? Read my reviews of issue #1, issue #2, issue #3, issue #4, issue #5, and annual #1. Last time, previous Thor (who I’ll refer to as Odinson from now on) conceded that Thor was worthy of the hammer, in addition to being able to do things that he could NEVER do with it. Odin isn’t happy with this turn of events and is being really scary, going so far as to bring his brother, Cul Borson, into the government of Asgard. He also turned on a sentinal called The Destroyer. I think he might end up being the main villain of this story. Meanwhile, Odinson asks Heimdall how he doesn’t know who Thor is if he can see everything, to which Heimdall replies that because Thor isn’t a threat to Asgard, he doesn’t really care – plus he’s not omniscient, per se. He tells Odinson to not worry about who she is, and concentrate on the immediate threats to Asgard as well as his own worthiness. Odinson then takes out some stress on rock trolls and goes back to the moon as he tries to work out who Thor could be. He also brings up Nick Fury’s whisper to him again, which might be the thing that I’m most curious about. The art in this issue is particularly gorgeous; my favorite panels are on pages seven and eight, showcasing the rainbow bridge with Asgard twinkling in the background. The scenes in the Hall of Medicine are also beautiful, and on page eighteen, there’s an AMAZING portrait of Thor. The cover art is really cool, with her silhouette filled up with possible identities. Also…Odinson has a sister? They should bring that up in the movies. Speaking of the movies, someone we’ll all recognize shows up in a way that I wasn’t expecting at all, as well as someone who’s very much the same. The issue ends on a hell of a cliffhanger, which I’m beginning to realize is nearly always the case. Can’t wait until next month!